I have finally been getting caught up on all the projects we put on hold over the summer. 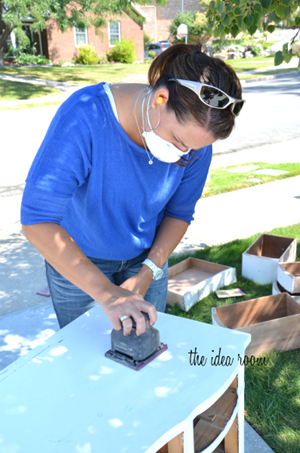 Today I want to share with you how some tips and pointers to prep for paint when you are repainting a piece of furniture. We inherited this vanity dresser from some family and have been using it in my daughter’s room for a few years. When we received it had been painted white. The paint job was pretty beat up and it needed to be refinished. We are also in the process of updating her room and we wanted to paint it in a fun color other than white. 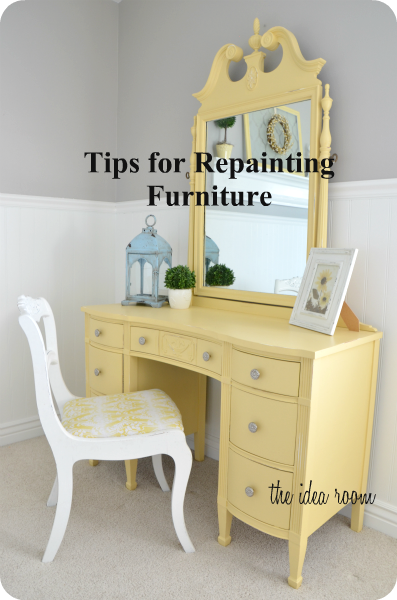 There are a few things that you need to know and use to make the process of repainting your old painted furniture as easy as possible. It is always a good idea to test your painted surface for lead. Since we did not know how old the paint was on the vanity dresser we were sanding down we wanted to be sure it was safe to sand the paint down. 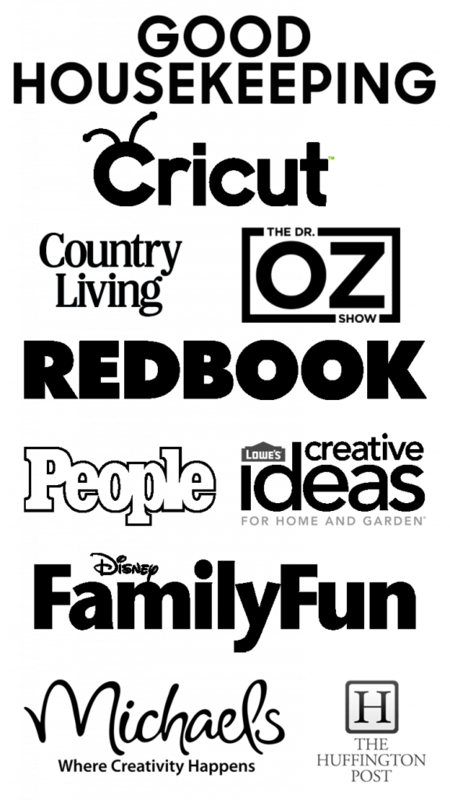 We did not want to be using or working with any lead based paint or breathing in the dust particles. 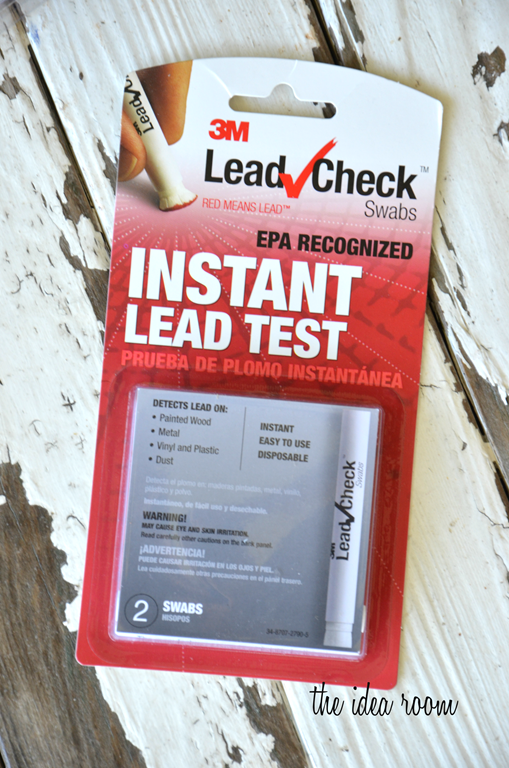 We used this simple 3M Lead Test from 3M TEKK Protection to determine if the old layers of paint contained lead. 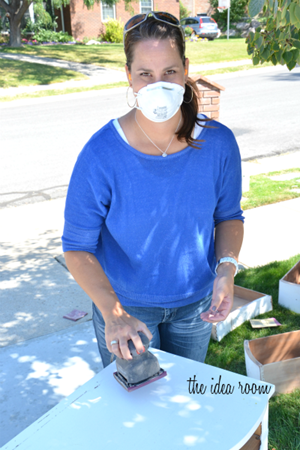 You do not want to be sanding down lead paint and breathe in the harmful particles. For a more detailed explanation of how to use the 3M Lead Test and other important tips for preparing this vanity dresser for repainting, check out the video below. 1. Now that we have determined that the paint is lead free you can go ahead prep your furniture for painting. Remove all hardware. I also removed the mirror since it was just a matter of taking out 4 screws. This makes it a lot easier to paint. I also took out all of the drawers. 2. Now you should be ready to sand down the furniture. We used a hand sander for the flat surfaces and drawer fronts, then used a piece of sand paper or a sanding block for the smaller finer detail work. Sand and remove all loose paint and any blemishes. 3. After you have sanded everything to a nice smooth finish you can do any repair work that may be needed. We glued a couple of loose drawer joints and filled in a couple of larger gouges with some wood putty. Let those areas dry completely and use a finish sander to get them smooth again. Be sure to prime any of these areas with a primer paint. 4. Take a damp cloth and wipe down all the surfaces to remove any excess dust. This step is very important to getting a smooth finish! Now go ahead and paint away. 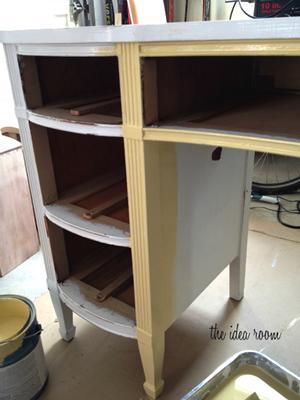 I will be sharing our favorite tips for painting furniture in a future post. I am really happy with how the vanity dresser turned out. It adds a punch of color to my daughter’s room. And she can fill it with her crayons and art supplies…and sooner than I want, makeup and hair products…oh boy! I am so not ready for that stage! We had this fun chair, so I recovered the seat and did some quick paint touch-ups on. 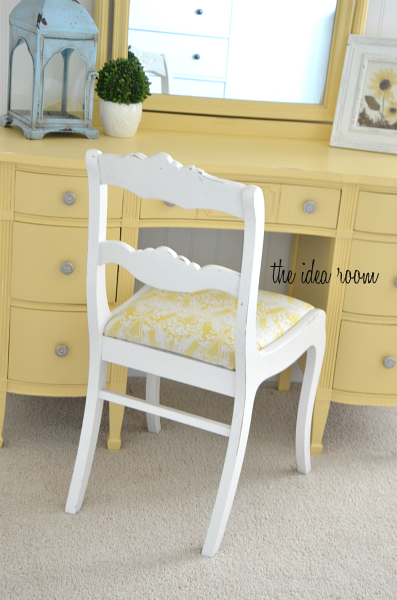 I decided for now to keep it white and I think I am loving the white chair with the yellow dresser. What do you think? Should I keep it white or paint it yellow? And since I know some of you are going to be curious…I painted the dresser with Sherwin Williams White Raisin. The room wall color is Benjamin Moore Rockport Gray with 50% reduction in color. 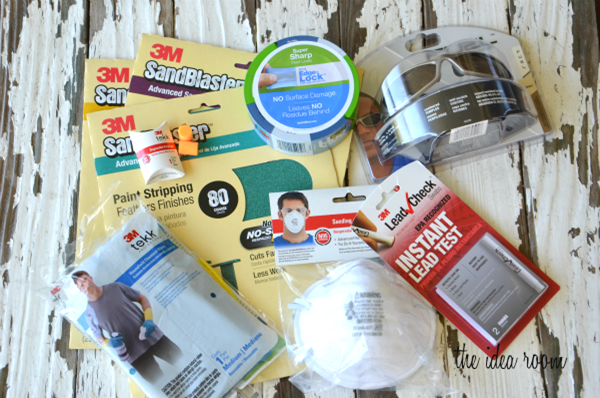 *Disclosure–This post is a collaboration with 3M DIY. To learn more about safety and preparation, visit 3MDIY.com. definitely keep the chair white! This looks great Amy!! I love that color yellow! Lookin’ fab in all that safety gear! I love the vanity with the white chair; it is perfect. I am glad you did this post, since my husband just gave me the “ok” on redoing our china hutch- under the condition I don’t blog about it. Harsh, eh? Do you have any tips for painting over stained/laquered furniture? 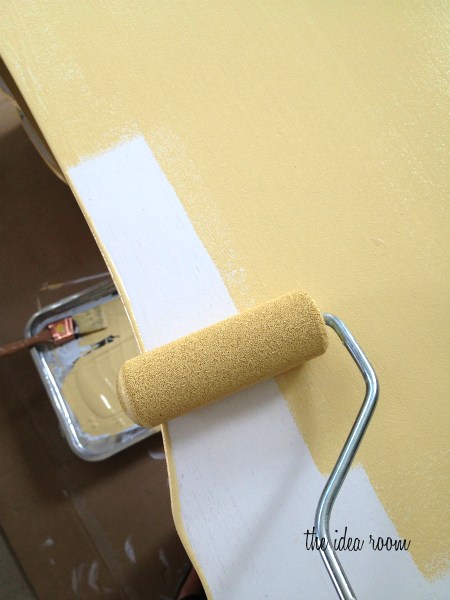 It’s lovely in that soft, creamy yellow. I like the chair in white, it’s a perfect contrast and the fabric is darling! You did a beautiful job, it’s a real treasure now. I love old furniture it’s the best! That is so cute especially with the white chair and fabric. I would keep it white! This is gorgeous Amy!! I would definitely keep the chair white, it looks great. That fabric on the chair is fabulous too. What a beautiful space for your daughter! Love the white chair with the fabric covered seat! Don’t paint it! I think the contrasting colors help to show off both pieces better. love the white chair and the yellow in the seat – don’t change a thing! You can just rough up the doors with some 150 sandpaper, wipe clean, and than prime before painting top color. You can use an oil or latex primer but if you use a latex primer you can not apply an oil base paint. What finish paint did you use? Did you do a protective coat of wax or poly over the paint? I am getting ready to paint a wood desk for my home office and am trying to figure out if a can of latex paint will do the job by itself. You can use latex but it would be best to prime with an oil or latex base primer beforehand. This will ensure that the top color appears evenly. Make sure you rough the desk with sandpaper to get good adhesion of the primer and than lightly sand the primer for proper adhesion of the latex top paint. what a beautiful transformation!! love yellow. Love this Amy!!!!! Now come paint stuff in my house! 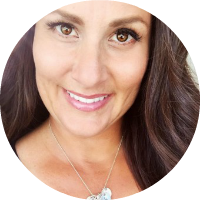 Wow – I love the way it turned out Amy!! Great job!! I love all the colours you chose! I also think the white chair is perfect ! The fabric u put on it ties it all together! So pretty! The color is gorgeous and the amount of contrast is perfect with the white chair and coordinating seat. I love the shape of the dresser. Beautiful! I love that paint color. 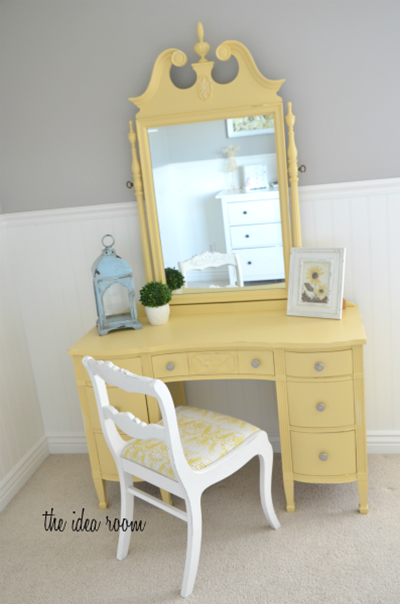 I like the choice of the pretty yellow for the dresser. That makes it a cheerful part of the room and could be a focal point. I also like the white chair for contrast. If you painted it yellow to match the dresser then I would add a pllow or small throwcto provide some contrast to the yellow. so pretty & fresh looking. i love the combo of the yellow & white. It looks stunning! love the curves and soft color, and i love the white chair! great job! These are pretty interesting products, especially the instead lead test tool. The new vanity table looks beautiful ! The color you chose is perfect. sooooooooooooooooo pretty!!! should I be using a face mask when sanding–oops! Keep the chair white. It looks awesome. I would like to see how you did the chair. Is that on here somewhere? I have the full set of this. It’s still the original mahogany. 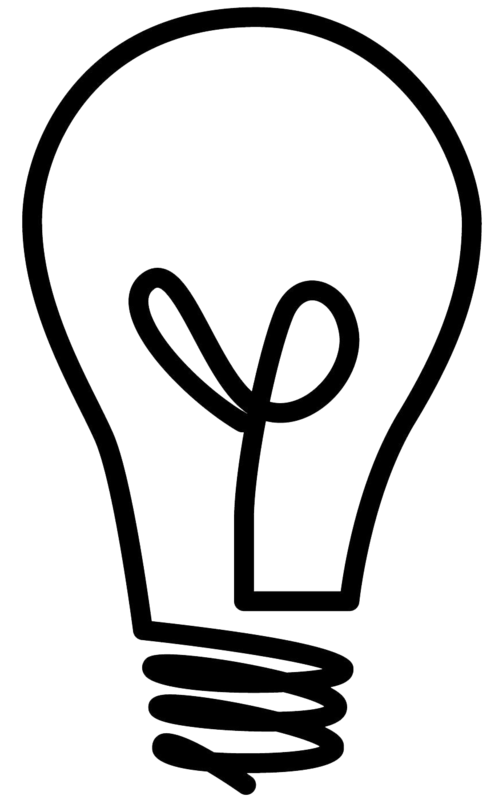 Now I have an idea for change. Thank you so much. What about Anne Sloans chalk paint ??? The yellow in the fabric matches perfectly. Think I might paint the hardware on the dresser white to tie it to the chair better. 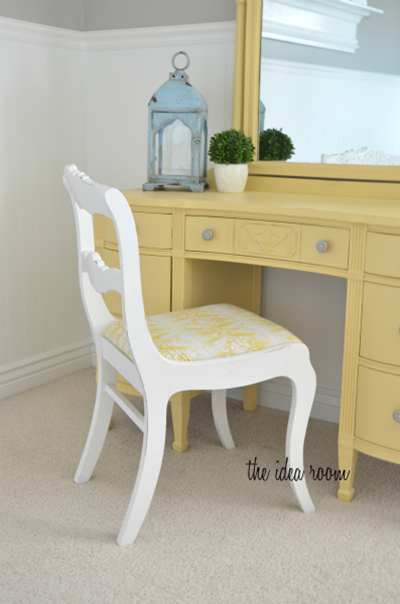 Or maybe even paint the chair with the yellow mixed half with white. This tutorial is great and I will definitely be sharing a link back here. Did you turn the paint into chalk paint or use it right out of the can? Right out of the can. Great question. I thought your suggestion to test the paint for lead before sanding was really helpful. I’m looking at repainting a couple old pieces of furniture, so this is really good to know. I’ll definitely test the paint out before sanding it so I can stay safe while doing my project. Earnest- So happy you found this post helpful. Good luck with your project. Wonderful article Amy, a pleasure to read and the pictures were awesome!